I just saw this Ensogo Deals promo and was very happy about this deal: Only 499Php per session of Gluta IV plus Vitamin C treatment at D' Spa and Skin Center. Take note that the original price per session is P1,500. That's 67% off! If you are not an Ensogo member, you can register for free by clicking this link. After registering, you can avail of this skin whitening deal from D' Spa and Skin Center. Glutathione is a natural antioxidant that all humans are blessed with since birth, but over time, our supply of the antioxidant becomes considerably reduced because it is used up our body in cell metabolism. The injection of glutathione, therefore allows the skin to have more of the antioxidant. An increase in glutathione helps make the skin whiter and rosier by reducing the melanocytes (which is responsible for producing melanin). It also aids in converting eumelanine (dark/yellow pigmentation) to phaemelanin (reddish white pigmentation). It also aids liver cells to regenerate from damages that are caused by prolonged alcohol abuse or intake of fatty food.The combination of glutathione with Vitamin C allows for the antioxidant to work better and leave lasting and more desirable effects. 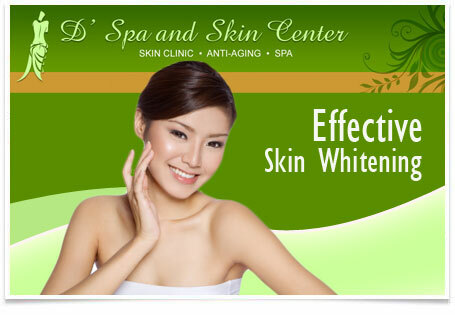 D' Spa and Skin Center has branches in Project 8 QC, Tandang Sora QC and Dagupan City. Note: The brand of IV Glutathione to be used is a choice of Saluta or Tationil in 600 mg doses. Hurry, this deal will expire in 148 hours upon writing this post!